I recently did a full review on this product so you can see my full thoughts on it here, but I felt that I had to include it in my April favorites because it is a.m.a.z.i.n.g! <3 First of all, I love its concept – a conditioner but for your body, not your hair, which makes your skin feel so moisturized and soft that it’s actually incredible. I have pretty dry skin and this seriously really makes the biggest difference! Not to mention how fab it smells – like non-artificial roses with a hint of honey (to me at least) and I can sit there and sniff it all day. Literally! :) I can’t recommend this to you enough, so please go ahead and take a sample and you’ll see what it’s so wonderful about it! If you are a regular reader of my blog then you are probably sick of seeing Essie’s Lilacism on so many posts recently but that’s purely because I love it so much! I probably wore it waaaay too much during April and I’ll probably continue applying it a lot during May as well hehe! 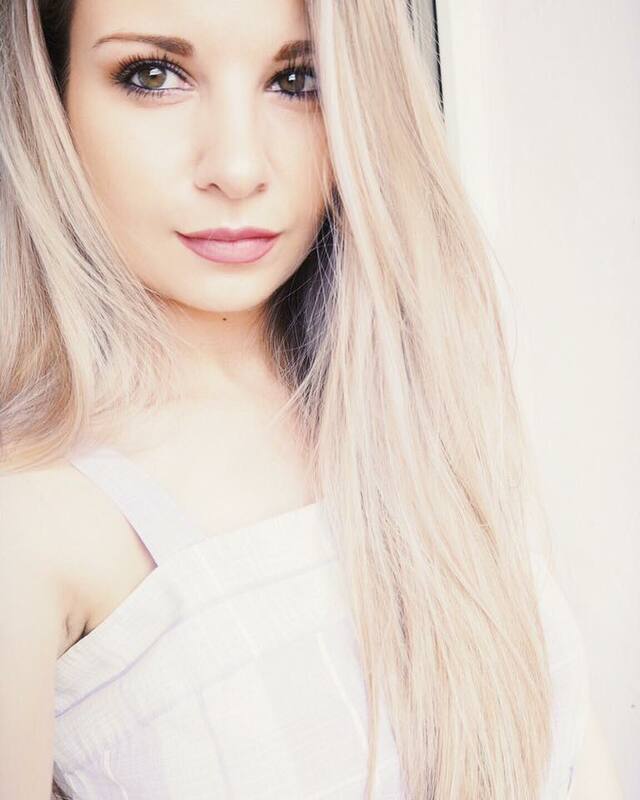 :)) It is the most beautiful pastel lilac shade, the quality is amazing and I am honestly in-love with it! I did a proper review on this nail polish, you can have a peek here. Ohh what can I say about this one… I think I found the perfect lips shade for me. 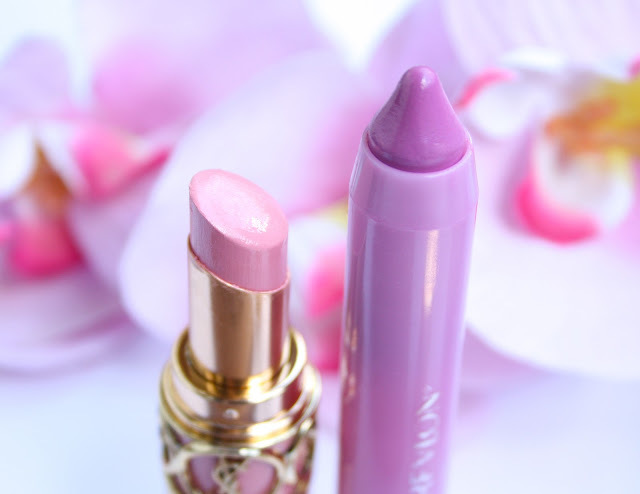 It is this blue undertone lavender pink color, which compliments my skin beautifully, and I get SO many compliments when I’m wearing! (: It smells just like peppermint and leaves a lovey tingly feeling on the lips, which I adore, it’s very refreshing. The balm satin is relatively moisturizing even though it may get a tad drying after a while. What I am not really loving about this product is that it’s not as pigmented as I’d hoped it would be! I manage to get the opacity I want but I have to put a lot of it but oh well.. I guess we can’t have it all haha! See review and photos of it here. Since the warmer months are fastly approaching I wanted to get a lighter, translucent powder and the lucky winner was Too Faced Primed & Poreless Powder, which I got a while ago. It adjusts to my skin tone really well and minimizes the appearance of pores amazingly! It feels so light and my skin is super smooth after applying it! I use it both as a primer (only with mineral makeup on top though) and as a setting powder and it really glues my makeup to my skin for hours! It is super fine and gentle and I find that the best brush to apply it with is my Real Techniques buffing brush whish gives me flawless finish! 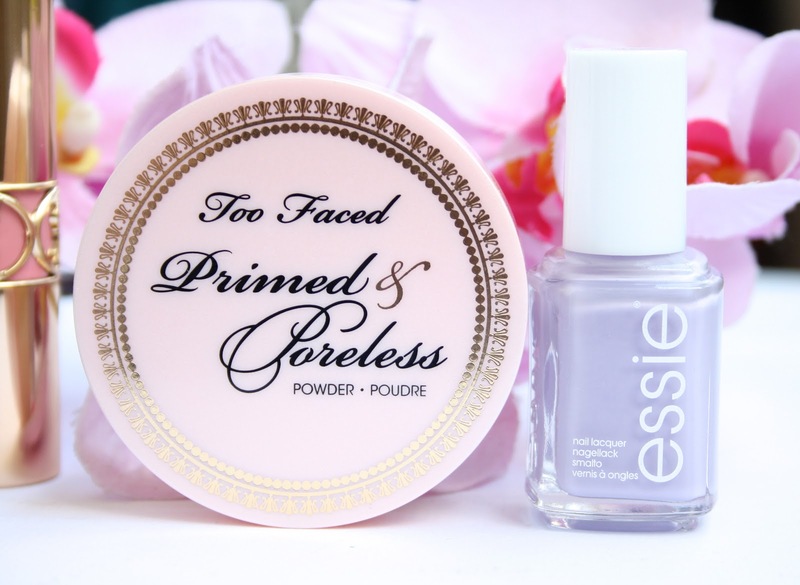 <3 I absolutely adore this powder and highly recommend checking it out! 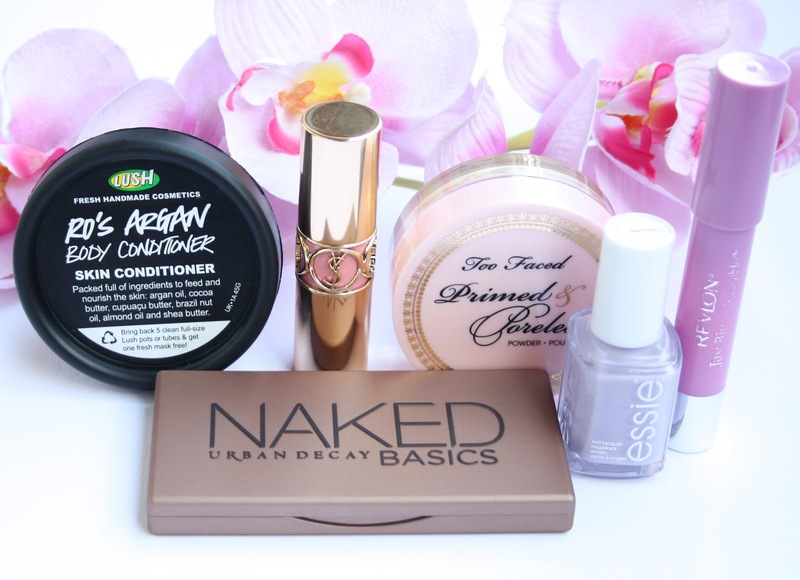 Great picks :D love the look of that YSL lippy! Looove Too Faced packaging! So luxe looking! amazing pictures! all of the products look beautiful- great selection! my favourite is the ysl lipstick and the essie nail polish! That naked basic palette is really great. I also like that the mirror inside is huge! The lipstick and naked pallet look so gorgeous! I need the YSL Lipstick in my life. It tugs at my heart everytime I see it on a blog. I need to try those Revlon stains! I really love that Essie shade. The YSL lipstick is gorgeous too! I really want to try both the Naked Basics palette and the Primed and Poreless powder! REALLY wanna try that YSL lipstick! I reaaaally want urban decay naked basics! Best eyeshaddow EVER! Love your blog! Your newest follower! I looove the Too Faced Prime & Poreless! AGH I've been dying to try the YSL lipsticks, they seem to be everywhere! all these products looks so nice :) especially the YSL lipstick! great picks! 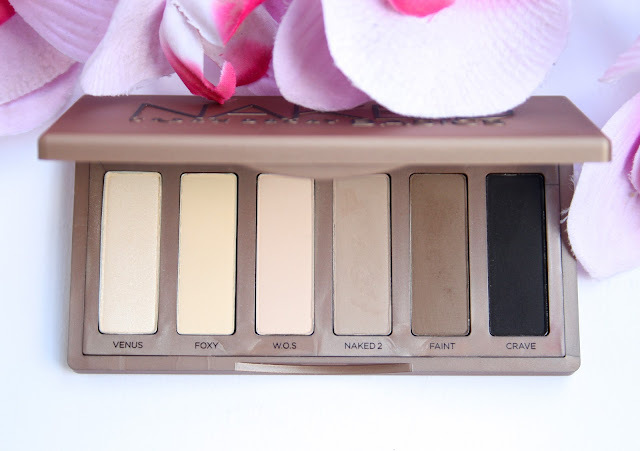 i really want the NAKED palette! I love YSL lipsticks. The rouge volupte line has a lovely forumla that isn't too drying on the lips. I have one in "Peach Passion" and I love it. It is such a lovely summer shade. Great color on that Essie polish, I love everything Lush! Great review. Thank you for visiting my blog, Will be eagerly waiting for more. Great post and great favorites! Such summery favorites love it. Gorgeous pictures! All of these products look so good! You take amazing pictures! I really want to get my hands on more Lush products but there aren't any stores nearby :( The body conditioner does sound really good though! The concept of a powder primer is really unique too. great selection!!! ysl rouge volupte are my fav liptsicks!!! love your pictures, which camera do you have?